Taking the Southern Expressway (E01) or the Colombo–Katunayake Expressway (E03) is bound to leave you amused, irritated and sometimes downright angry at fellow drivers who don’t seem to get the rules or just exploit it anyway! We compiled a few common mistakes us Lankans make on the expressway. Cue the choice curse words! Let us know if we’ve left any out! We’ve all been guilty of crossing that 100 kmph speed limit at some point when we are on the expressway but there’s always that one person whose intent on making that 1 hour drive to the location in 20 minutes! Don’t try it. Stick to the speed limit! A cop we met on the expressway once recommended that we drive at 95 and overtake at a 100 to avoid getting a ticket. Going over the speed limit is bad enough, but driving way below the recommend speed limit is hazardous as well. Why? Let’s say you’re on the inside lane doing 60 kmph, the person behind you is sticking to the right speed of 95 kmph. At that speed, braking distances and reaction times are far greater than on usual road conditions. This is what causes pile-ups on expressways. If you or your vehicle is not capable of sticking to the correct speed limit, it is best not to drive on the expressway as you’re putting yourself and others in danger. When our Lankan drivers travel on the expressway with friends in other vehicles and they are done racing each other, they like to drive parallel to each another - one on the left lane, the other on the right. They’ll wave at each other and grin at each other and make a few hand gestures while totally ignoring the fact that there are other people behind them just waiting to overtake them. Stick to the left side driver! The right is for overtaking only! 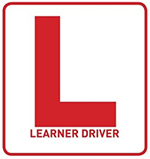 Congratulations on deciding that you want to learn how to drive! We have plenty of spots for you to test drive but the expressway just isn’t one of those places. Everyone assumes that it will be easier to learn to drive on the expressway but it’s the complete opposite. Unlike on normal roads, expressways have a minimum speed limit and a maximum speed limit as well so there are vehicles constantly speeding; newbies will not only find that it’s difficult to keep vehicle balance, the overall experience of impatient people trying to speed past them might be a bit terrifying. Also it’s a bit of a risk to the other drivers on the expressway because the smallest mistake, like accidently breaking or recklessly shifting the track, might cause an accident. As mentioned before, braking distances change according to the speed you’re travelling in. Bringing a car to a complete stop from 100 kmph is vastly different from slowing down from 40. So remember that when driving on the expressway, TAILGATING IS A HUGE NO! Make sure to keep at least 3 car lengths' space from you and the vehicle in front of you. This way if the vehicle in front has to make an emergency stop, you have enough time and space to stop safely. Help yourself and help every other driver on the expressway. Know the rules. Know that you can’t stop in the middle of the expressway to take in the sights or park on the side of the curb and have a picnic! Always have a full tank of fuel (and if you don’t, make sure to fill up at the half way point!) and remember that the toll gates don't take cards, so keep some cash at hand and upon reaching the toll gate, make sure you’re in the correct lane as some lanes are reserved for ETC (Electronic Toll Collection System) users. Another thing we have noticed is the lack or the improper use of indicators. Always indicate when you want to change lanes or merge back into the inside lane, thus informing the other drivers of your intentions. Also make sure your car is in good mechanical order before you make the trip. “I had the misfortune of viewing a dash cam video recorded on the Southern Expressway where the car plows right into the back of a van that was stopped on the inside lane as it had a flat tire. And the owner of the van thought it would be nice to change his tire. The Hard Shoulder and its purposes are practically unheard of to majority of Expressway users,” says Charith Kulasiri as he recalls an accident he saw online. If there is an accident or a breakdown, know what your options are. Call 1969 for any emergencies on the expressway. Happy travels!